Thien Temple is located at the village of Dau about 23 km from Hanoi the capital of Vietnam and there is a small chapel nearby the temple. This article is about a weird deity waiting for visitors at this chapel. It is Vu Khac Minh; the former Abbot (chief) of the Monastery. For more than 300 years; this former Abbot is sitting on a stone platform in lotus posture (padmasana –squatting with toe of one leg on the thigh of the other) in this small chapel with a mystical smile on his face. Beholders of this still figure feels some strong innate feelings – as explained by them; it is the understanding the difference from living and dead. If not convinced; just pay a visit to Thien Temple at Dau and look at his still face. 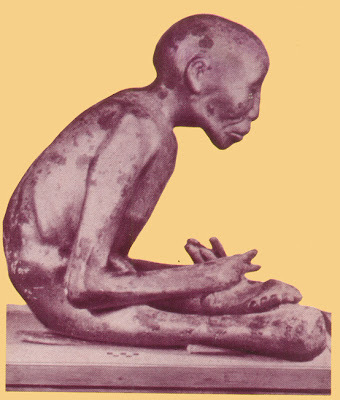 Vu Khac Minh is not an ordinary mummified body like that found in Egyptian pyramids which have their inner organs removed; strapped in silk and treated with chemicals spice, salt etc. He only wears the conventional cloth of the Buddhist monks put on by the temple staff; otherwise the body is naked (not embalmed). He simply sits in an unsecured chapel where humidity is abundant enough to decompose any organic substance. It seems surprising to see that Vu Khac Minh’s body has not affected by any elements of the tropical weather for the last 300 years. Vu Khac Minh was formerly a high ranking officer under the Le Dynasty who ruled Vietnam; after getting promotion to the highest position of his career in the King’s senate he sought retirement and retreated to this monastery and led an extremely ascetic life. Due to his commitment and devotion he got promoted as the Abbot of Thien Monastery. When he became aware of the end of his life; he secluded himself to this small chapel; instructed his pupils to visit him only for the customary rituals after his death. Thereafter he avoided food and water and went on immersed in prayer for hundred days and gradually merged with the eternity. His last instruction to the monks who gathered around him at the time of his death was this “My time has come; after the departure of the spirit from this body; wait for one month; if any fowl smell arises from the body bury it as per the customary rituals; if there is no sign of decay leave me here in this posture itself and let me go on praying”. Even after passing two months the body remained as such; and the disciples covered the body with some protective paints to keep it safe from insect attack and dressed it with monastic silk attire which is being changed everyday. For the villagers and monks Vu Khac Minh is a living Buddha and all the customary rituals performed to a sacred Buddha Idol is done to him. While Vu Khac Minh went on sitting; history passed by; many things happened all around the world; in Vietnam itself; the Le Dynasty -where he served as an officer- vanished; Nguyen Dynasty came to power; then came the French; Japanese rule followed and the US came and retreated after the unceremonious Vietnam war; Communist came to power; both Vietnams got united and at last democracy and liberalization come to vogue. Vu Khac Minh goes on watching all these with his stoic smile; and he will be there to watch the unknown future events that are to happen for many more years. Mummifying is not alien to Buddhists; as in Tibet, China and other nations; monks of the highest ranks were mummified and kept for veneration; they believed that these mummies were living Buddhas and capable of warding off evils and bringing in prosperity. Such mummies are called ‘Mardongs’. Mardongs were prepared by boiling the dead bodies of high ranking priests in butter and leaching them in salt after removing internal organs. These mardongs were given masks of gold or brass for a face. 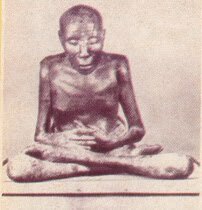 The 13th Delai Llama of Tibet; Thubten Gyatso who died in 1933; mummified and kept in the Portong Marpo Palace in Lhasa is the best specimen Mardong. When the Communists came to power in Vietnam; the news about the ‘monk who turned to stone’ reached the authorities. Smelling something fishy about stories; the authorities immediately sent a team of experts to study and ascertain fact. The team took the ‘statue’ to the Military Hospital at Bac Mai and subjected it for thorough studies including X-ray tests. Fortunately they did not dismember the body for ‘detailed investigation’. The investigative team comprised of archeologists and forensic experts were wonder struck as the X-ray films revealed that all the internal organs of the human body including skeletal structure remained Intact. There was no sign of any mummification done but for the silver compound paste that was applied by the monks after two months of his death. The authorities got convinced that their subject ‘the statue’ was in fact a human body and returned the same to the villagers. Thus the deity was placed back to its original abode. The body was so dry that it weighed just seven kilograms! It is a Soviet author by name Igor Lisevich who reported about the monk to the outside world but unfortunately he could not take a photograph of the monk on the spot due to some error occurred to his camera. Thus we miss the sardonic smile of the dead abbot. Mr Lisevich had added two photographs retrieved from his archives. These two photographs were taken by Nguen Lanh Cuong at the time when the body was taken for testing at the Military Hospital at Bac Mai. The same is given for the information of the readers. Most of the information is collected from one erstwhile Soviet publication by name ‘Sputnik’.